It’s funny how at this point in the Reset, we realize that we are actually living and eating the way we want to be living and eating. When we clear out distractions and negative patterns of thought and realize all the ways we numb ourselves, we are left with no choice but to choose our activities, associations and yes, meals, with the best intentions. The diet isn’t strict. We cut out refined flours and gluten, dairy, alcohol, sugar and limit caffeine, which can seem harsh at first as we get of our go-to convenience foods. By two weeks in, however, most people adapt and get in the habit of keeping nourishing food around. There’s also a lot of information presented. This fall we’ve so far addressed how the adrenal system and cortisol production occur, had some seminars on basic Chinese medicine theory and also jumped into how the precepts of yoga offer simple guidelines for daily life. Since it’s the equinox and this time of year is all about balance, I wanted to share with you a tidbit from one of our self-study sessions, this one about Yin and Yang. I hope you enjoy! People can also be relatively yin and yang to each other in personality and body type. For example, a tall guy with a bright red face, loud voice and aggressive body movements is displaying an active yang. He might suffer from heat symptoms such as acid regurgitation, alternating constipation and diarrhea and heartburn. Contrast this with an older plump woman who has excessive yin: she has cold hands and feet, a bloated belly, watery bowel movements, and dark circles under her eyes. There are many specific tools in Chinese medicine that can help pinpoint more details about particular cases, but just looking at the relationship between yin and yang generally gives clue how to proceed. There is also a balance of yin and yang within each individual. Symptoms of bloating, weight gain, sluggishness, chilliness and fatigue, could reflect too much yin relative to yang. (Or not enough yang relative to yin.) Restlessness, agitation, and tendency to fevers, cold sores, or insomnia suggest a predomination of yang. Since they are interdependent, in practice there is often a complex relationship between yin and yang that requires close observation to sort out physical and emotional symptoms. The chart above applies to location in the body. 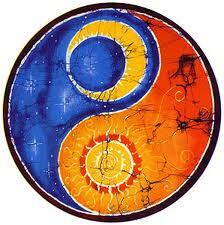 Yang and Yin also have manifestations of qualities, signs and symptoms that help make sense of the patterns at work. This chart breaks down some of the important ones. The relative proportions of Yin and Yang offer a look at how the body is functioning. It is a simple way of taking stock of basic factors such as heat/cold, excess/ deficiency and internal/external that can help understand what kind of support a person needs. It is the simplest of Chinese medical theories, yet encompasses the continually evolving nature of every living thing.